Norwegian game designer Ragnar Tørnquist is perhaps most associated with the classic PC adventure game The Longest Journey and its sequel, Dreamfall. The two posit that our world is really only half of the world-that-is, and that our Earth as we know it has remained sundered from its more magical, mystical half for ages. In upcoming MMORPG The Secret World, Tørnquist and Funcom continue investigating the theme of the unknowable truths that could lurk beyond our understanding. The game takes place in the "real world," but with a catch: as far as the game is concerned, every myth, legend, conspiracy theory, and weird supernatural rumor is true. The story revolves around the three factions who would run the world: the Templars, fighters against darkness; the Illuminati, controlling the global purse-strings; and the Dragon, creating ripples in the world one well-placed action at a time. At PAX East last weekend, I had a chance to see The Secret World in action and to speak with two members of the communications team from Funcom's Norway office, Erling Ellingsen and Tor Egil Andersen. Ellingsen and I sat down for a few quiet moments (a rare feat at PAX) to discuss the game. Ellingsen first confirmed that public beta weekends, for players who pre-order the game, begin on May 11 and will run nearly every weekend until the game's launch on June 19. The closed beta began last April. He spoke excitedly about the three secret societies that form the backbone of the game, describing how the Dragon, Templar, and Illuminati storylines inform everything the player sees and does. This particularly applied to the presence of PvP gameplay, which Ellingsen assured me was not absolutely required for any player but would be beneficial to experience for most. The PvP mechanic wraps around the intricate story, he explained, giving the gameplay, the spoken words, and the world a way to connect. The Secret World includes two kinds of PvP gameplay. Warzones are a drop-in, drop-out persistent setting that can hold up to 100 combatants trying to blast each other into oblivion. However, the game also includes specific, strategic battle locations such as Stonehenge or the lost city of El Dorado over which the three secret societies battle for control. Whichever faction controls a key location sees a benefit (the exact nature of which was unclear, but implied to be some kind of small buff or leveling boost) applied to every single character of that faction on the server. Finally, I had my chance to play the game for myself. I found myself standing at a PC, in control of a dark-skinned young woman in a pink vest. My Templar avatar and I were standing just outside of Kingsmouth, a fictional, Lovecraftian New England town. We had just arrived here from London, I was told, and from here the mysteries would unfold themselves. I strolled down the road and ran into an incongruous cowboy sitting by a fire. The man, Boone, had a short cut-scene monologue in which, before he directed me to my next NPC in town, he hinted darkly to me that whatever was going on, the Templars had more to do with it than I could know. He was here for a reason, but finding out why was something that would have to wait. Foreshadowing over, I made my way down the road, taking the time to explore. Clearly, some tragedy had taken place here. A number of cars had crashed, and their drivers and passengers had been killed. I wondered about what had happened, and felt badly for the victims for a moment. I wandered closer to one of the wrecks to see if I could figure out what had happened, but immediately understood my error: in a zombie-infested town, the dead don't stay that way. With eerie precision, the dead rose from the car and came for me. Time to figure out how my skills worked! I made short work of my zombies with some kind of AOE knife trick I was delighted to find I had, and continued down the road. Over to the side I saw a man make the same mistake I had made, wandering too close to a car, and he was immediately overwhelmed. Running to his side and helping him dispatch the swarming undead felt like the most natural act in the world, after which we easily parted ways again. Other games have made the promise before of managing a true level-free, class-free system, but few have successfully followed through. The Secret World looks as though it really stands a chance. The massive skill wheel I was presented with breaks down 500 skills into comprehensible groups and trees, letting players customize as they will. Players can also store builds and swap them in or out at any time, which looks extremely useful. 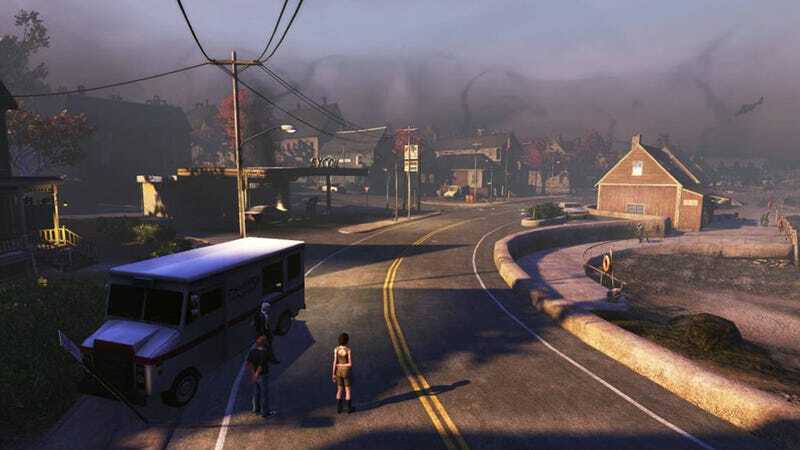 From moment to moment, conditions in The Secret World can change quickly and the value in being able to replace a melee-focused build with a ranged or more defensive build on the spot was obvious. Ellingsen stressed to me, earlier, that the idea was for each player to find their own best personal build of all the skills available from the wheel. He added that in addition to saving and loading builds, that skill builds a player created could be shared to his or her friends. In practice, I suspect that twenty or so of the most effective combinations will be lauded on message boards and passed quickly around server populations. Still, the opportunities are open for any player to create the invidividualized class of their preference. Overall, the game feels deep and deeply complicated, but manages to avoid feeling at all intimidating or confusing. The UI is clean, simple, and unobtrusive and the modern-day, real-world setting made acting feel intuitive in a way that more common, high-fantasy oriented MMOs sometimes don't. Quests emerged from organic sources, such as picking up a missing persons report from a desk. I only had about 15 minutes to play the game hands on, which is a short time for forming an impression on any game but especially an MMORPG. But the impression I had was this: I immediately wanted more. Kingsmouth had sucked me into its mystery, and I wanted to keep exploring, to find out what the hell was really going on. I wanted to help find some of the town's missing citizens (the first mission I picked up in Kingsmouth proper), I wanted to help the other players who (like me) were foolish enough to wander into the cemetery, and I wanted the time to dig more deeply into the story. What The Secret World showed me, that I most enjoyed, was a true sense of character, personality, and place. The game felt like it had soul, which can be hard to find. Ellingsen promised that Tørnquist has laid out the story for years of content yet to come, with the game's world written and defined from the dawn of time through the present day to the far future. Myths and legends from cultures far and wide wind into the unfolding narrative. Every element of the game is a jigsaw puzzle piece, and only after hours of play do they start to come together into a whole. Personally, I look forward to being able to work on that puzzle later this year.